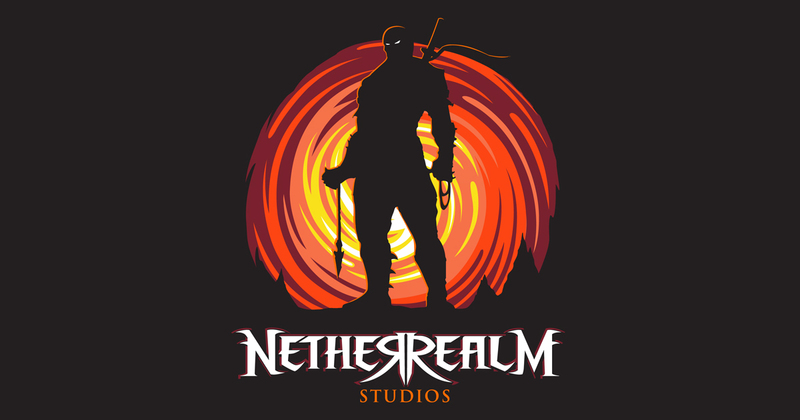 NetherRealm Studios, along with their fearless leader Ed Boon, have emerged as one of the premier fighting game developers with the long-running, ultra-popular Mortal Kombat series, as well as the recently released sequel to Injustice: Gods Among Us, pitting various DC Comics superheroes/villains against one another. Boon is one of the original creators of Mortal Kombat and has an established track record of producing solid games. While I have never been a fighting game connoisseur, I have always had a special place in my heart for the Mortal Kombat series. I have many fond memories of playing the first two games on Sega Genesis, spending quality time with my brother and our friends trying everything we could to execute every single fatality and beat the game with every character. Over time though, I fell out of love with the fighting genre. It was one of those “it’s not you, it’s me” kind of partings. My departure began in 2008 with Street Fighter IV, and then the reboot of Mortal Kombat in 2011 was my own personal nail in the coffin. To me, fighting games just are not the same unless I am in a room full of friends binging on Pepsi and Pizza Hut. The last fighting game that really sucked me in was Mortal Kombat: Deception in 2004, the follow-up to the first fully 3D Mortal Kombat game, MK: Deadly Alliance. I have probably put more time into Deception than every other Mortal Kombat game combined, without even the slightest hyperbole. However, the reason for this fascination was not because of the fighting mechanics. Neither was it the iconic characters, the inclusion of “Chess Kombat,” or even the Puzzle Fighter rip-off “Puzzle Kombat.” Despite the fighting being decent, that was not what kept me going. The thing that really sucked me in was “Konquest.” Konquest mode was established in MK: Deadly Alliance, though at the time it was nothing more than a series of challenges for each character to help you learn their combos and special moves. Mortal Kombat: Deception took the idea of Konquest and expanded it to the umpteenth degree. One of the new characters added to Deception was a warrior named Shujinko. If you just jumped right into the fighting portion of the game, you would see that Shujinko is a man well advanced in age. Konquest mode on the other hand uses Shujinko as its main character, and chronicles his life from a young boy all the way up to the beginning of the Deception story in an action RPG/fighting hybrid, completely separated from the arcade portion of the game. Shortly after his training with Bo’ Rai Cho, Shujinko encounters an otherworldly being known as Damashi, who convinces Shujinko to help him acquire six powerful items, collectively known as the “Kamidogu.” When Shujinko finally collects the sixth piece (46 years into his search), Damishi reveals himself to be none other than Onaga, the Dragon King, who manipulated Shujinko into finding the Kamidogu for him for his own malevolent purposes. I wanted to get the story out of the way, because all things considered, story in a Mortal Kombat game is typically secondary to the actual gameplay. Shujinko is not a the most well-designed character; when Onaga reveals himself, you start to wonder why Shujinko never asked any questions and just went along with everything “Damashi” told him. It is a weak plot, but it is also mostly there just because it needs to be. The story takes place across six different realms, each of which contains a piece of the Kamidogu. You start off in Earthrealm, and over the course of the game you travel to Netherrealm, Chaosrealm, Outworld, Orderrealm, and Edenia. Each realm has various missions and challenges, though most missions amount to nothing more than fetch quests. The challenges are typically normal fights with some sort of stipulation added. For instance, one challenge requires you to defeat Scorpion while Shujinko is bleeding, causing your health meter to be constantly depleting over the course of the fight. Other challenges include not being able to use the weapon stance, the inability to use projectiles, etc. 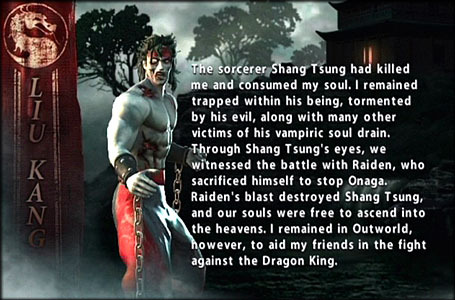 Unlike Konquest mode from Deadly Alliance, the updated version provided a legitimate reason to play through it. Treasure chests are scattered throughout the various realms, which contain either coins (or rather, Koins, since this is Mortal Kombat) or keys that unlock items in the crypt (or rather, the Krypt, since…well, you know). The Krypt is where you unlock new items, such as hidden characters, alternate outfits, concept art, behind-the-scenes videos, and more. Koins can be accumulated through the other modes that the game offers, but Konquest is the only place to obtain keys to certain coffins in the Krypt. A lot of the treasure chests are in plain sight, but if you want to unlock everything in the game, it would not be a bad idea to have a guide next to you. Some chests only appear at certain times, days, or places. The most ridiculous of these are the chests to acquire series hero and primary protagonist Liu Kang, as well as his alternate outfit. Liu can only be acquired after returning to Konquest mode once again after completing it, at which point his treasure chest still only appears on Thursdays behind a tent in Edenia. His alternate outfit is even more specific, requiring you to be at coordinate H-5 of Edenia on the first day of any given month between 12:00pm and 1:00pm. Trust me, you want the alternate Liu Kang, because the “normal” Liu is a zombie. You heard right: Zombie Liu Kang is the default Liu Kang in this game. 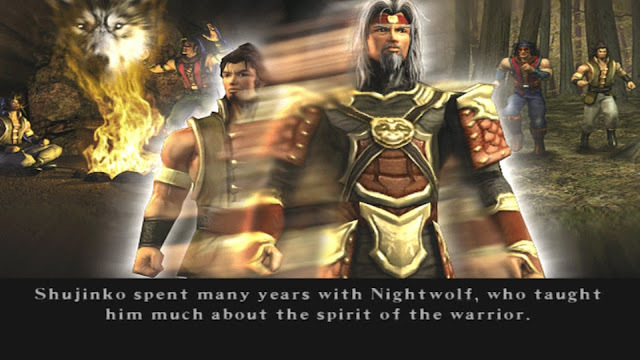 This stems from the developer’s idea to kill one of the series most beloved characters in a cutscene at the beginning of Deadly Alliance. Luckily the game gives you the option to meditate, causing time to speed up significantly, so if you happen to miss the time frame for a certain item, you can get back to it quickly. No missions are time sensitive, meaning you will not miss out on anything should you decide to meditate for a substantial period of time, which was a good design decision considering how tedious obtaining chests can be. Despite the story not being exceptionally strong, it is still annoying to miss out on items or missions due to a time restriction in any game, which has been a prevalent mechanic in many RPGs over the years. There were also some weird design choices in Konquest. Over the course of the adventure, Shujinko encounters certain characters who provide a tutorial. When the tutorial starts, Shujinko transforms into that character. It was done as a way to teach you the combos and special moves of the other characters in the game, though that could have been accomplished with the simple addition of a practice mode. Or conversely, you could just learn the characters the old-fashioned way: by playing the game. Another weird design choice was locking Shujinko’s special moves in the Krypt. In order to use Shujinko’s special attacks in the arcade and versus modes, you have to find the keys in Konquest. If Deception were made today, this would almost undoubtedly have a microtransaction option attached to it. The Konquest mode really hyped me up prior to release, as we were told that it would feature every Mortal Kombat character up to that point. The 37 different colors of ninjas, the really bad characters that only made it into one game like Nitara and Movado, and even Stryker was there. I hate Stryker. Everyone hates Stryker. But I was really excited to see his dumb face in the Orderrealm. Mortal Kombat: Deception‘s Konquest mode does not do anything great, but it does everything well enough to be a solid time-waster. In 2004, there were better fighting games, better RPGs, better stories, better voice acting, practically everything Konquest did was done better by somebody else. That being said, for me it was the perfect mishmash of all things Mortal Kombat, and what resulted was one of the best things Ed Boon has ever put his name on. Unless you count Noob Saibot.